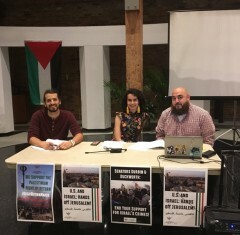 Chicago delegation sees Palestinian resistance first hand | Fight Back! Chicago, IL - Members of the U.S Palestinian Community Network from Chicago (USPCN) reported, August 24, on their summer delegation to Palestine. Bassem Kawar stated at the beginning of the event that their purpose was “to take our leading members and organizers to get a firsthand understanding of the occupation and the resistance on the ground.” They met with over 20 Palestinian organizations in the different “Fronts of Struggle,” which was the title of their talk. Muhammad Sankari opened by talking about the 6000 Palestinian political prisoners, and the occupation’s use of administrative detention. This policy allows the Israelis to detain someone without charges for six months at a time, and extend indefinitely. These prisoners are held under what is called “secret evidence” by a military court. “This policy is used to break the back of the Palestinian liberation movement,” explained Sankari. Adameer is the organization that defends Palestinian prisoners, including the case of Ahed Tamimi, the 16-year-old imprisoned after a video was released showing her slapping the Israeli Defense Force (IDF) soldier who had shot her cousin in the head with a rubber coated, metal bullet, causing severe damage to the boy’s skull. Delegates saw the worst examples of the occupation in Jerusalem. For example, Israeli police regularly harass youth to pressure Palestinians to leave. Thousands of Palestinians live ‘illegally’ in Jerusalem and can be deported to the West Bank. The other two fronts of struggle the delegation documented were cultural and health and environmental resistance.